- Hand detailed VINTAGE Slave one toy. -hand made custom wooden stand. 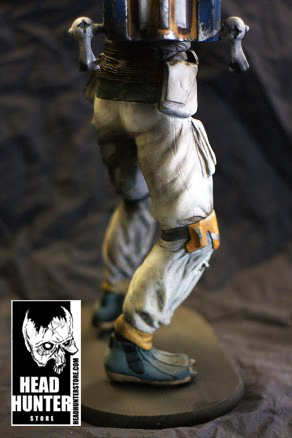 -Chrome FETT logo on base. 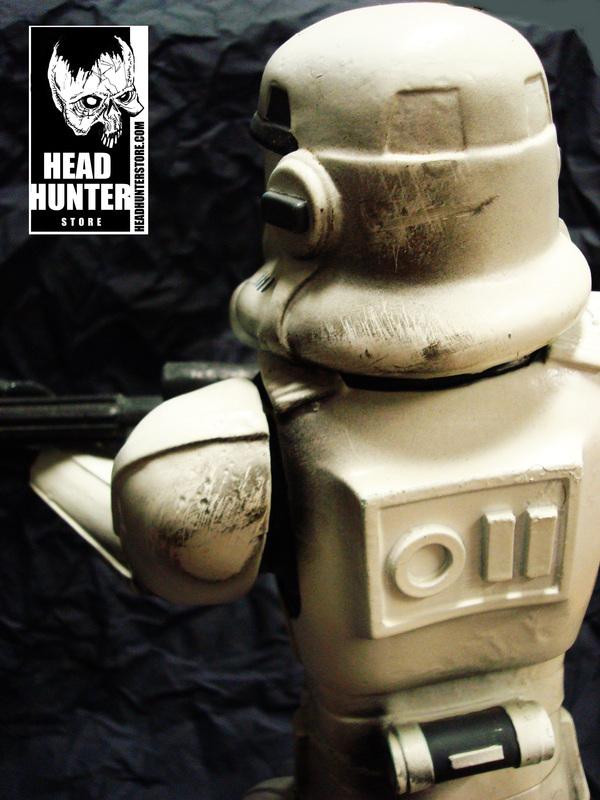 IMAGE by: Markus Paukkula - this is a Slave one model by HEAD HUNTER STORE. RETURN OF THE JEDI - BOBA FETT STATUE (FLAME THROWER). 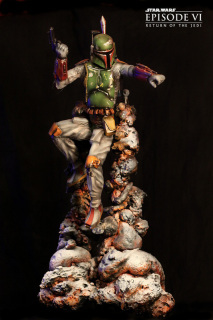 Custom made Bobba Fett statue. 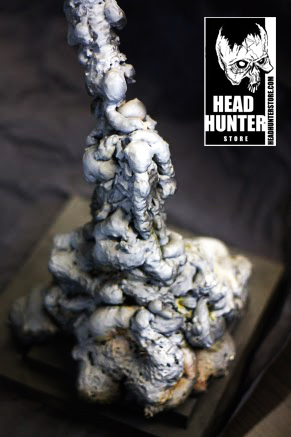 This is probably as good as it gets when it comes to showing what HEAD HUNTER is about. 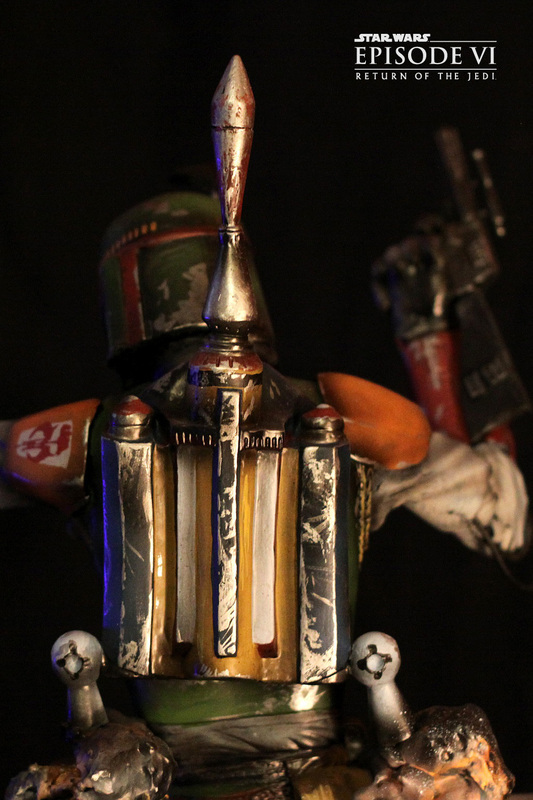 This build began with a standard SCREAMIN Boba Fett vinyl kit. This was then painstakingly chopped and reposed to achieve the dynamic pose required. 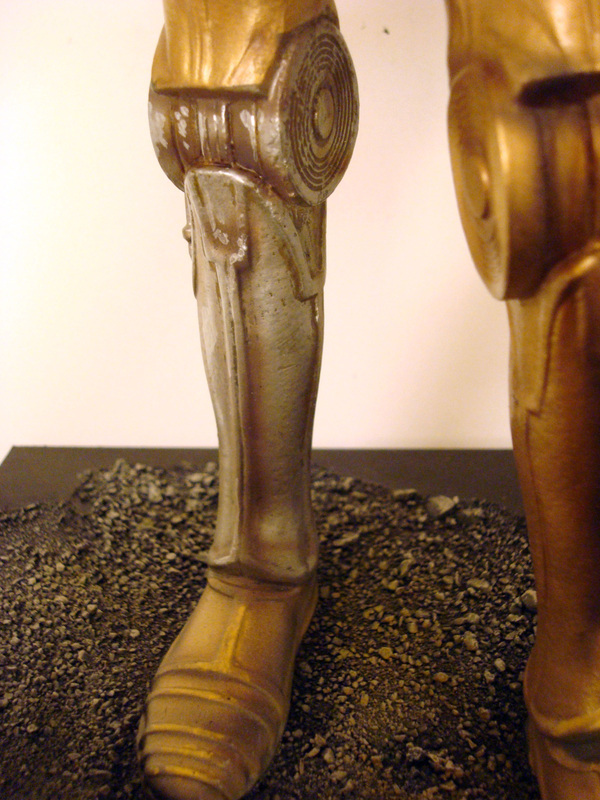 Once posed the statue was filled, sanded and detailed. 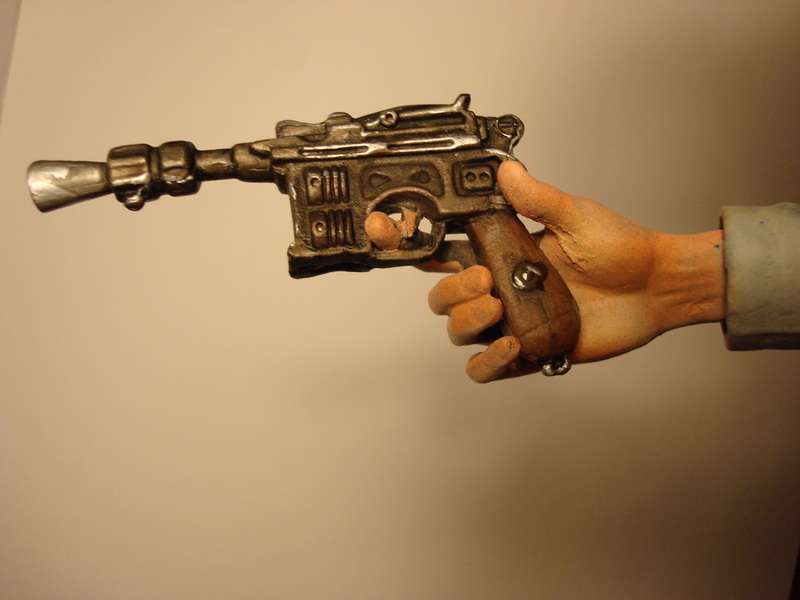 The blaster is also custom, having been built from scratch. 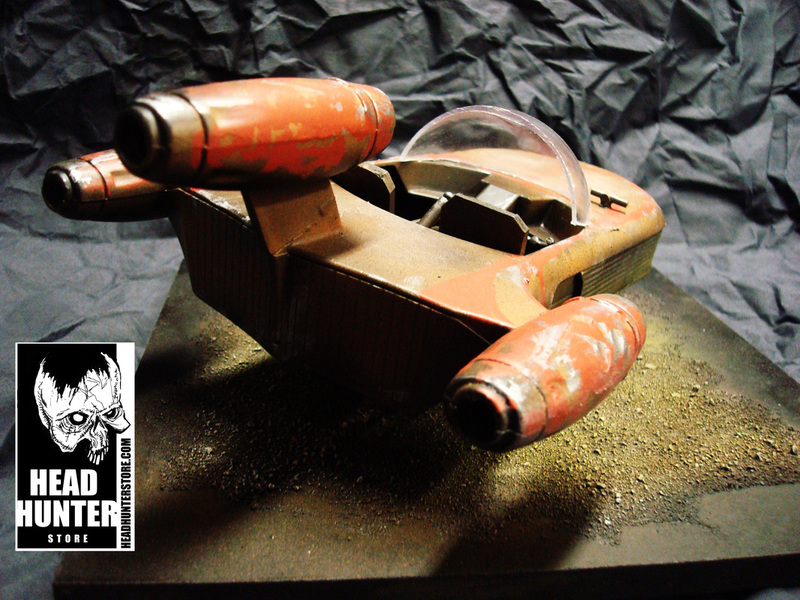 Once this was done the custom base was built, using wooden construction for support, and hardening foam for the jet-pack plume effect. Assembly followed and then priming. Once complete the base colours were laid down with spray cans and acrylics. 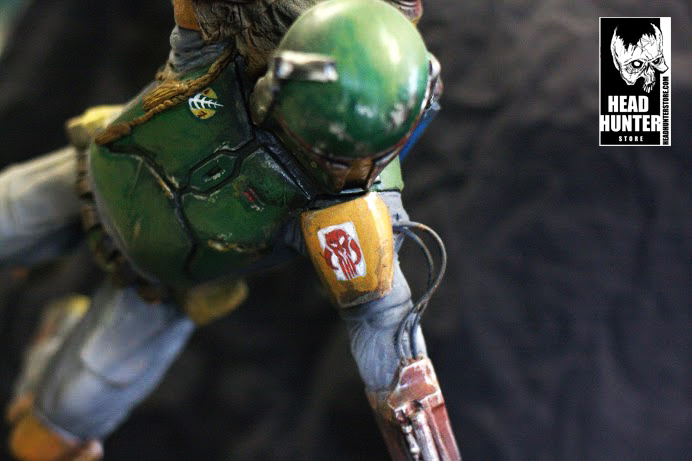 Finishing was the final stage, hours of airbrush work, and hand weathering completed the look of this Empire Strikes Back version of Boba Fett. 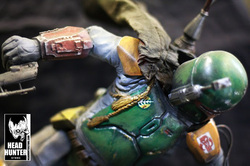 Boba Fett is a character in Star Wars. 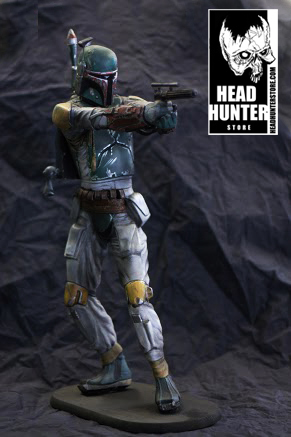 A bounty hunter hired by Darth Vader to find the Millennium Falcon, he is a minor villain in both Star Wars Episode V: The Empire Strikes Back and Star Wars Episode VI: Return of the Jedi. Star Wars Episode II: Attack of the Clones establishes Boba Fett's back story as a child clone of Jango Fett, who raises him as a son. 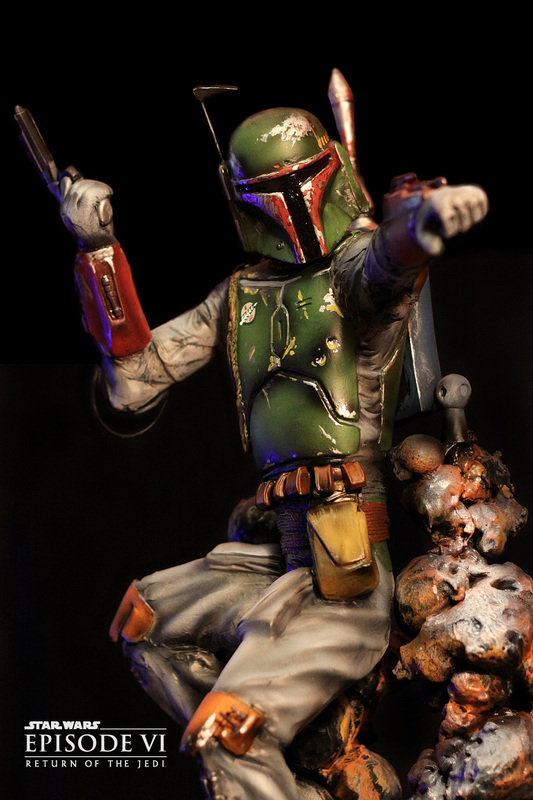 Boba is created for Jango by the cloners of the Planet Kamino who are responsible for the creation of the Clone Army that the republic will eventually enlist. 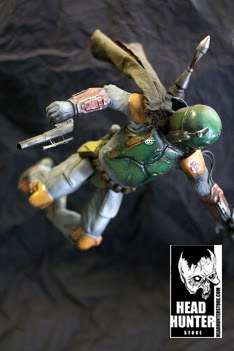 The Star Wars Expanded Universe expands on Fett's origins and career as a bounty hunter. 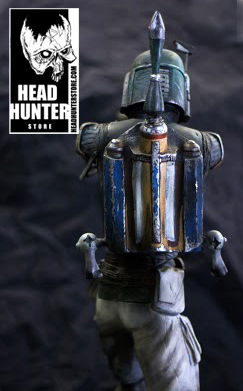 Fett's air of danger and mystery have created a cult following for the character, who has been merchandised across multiple media. 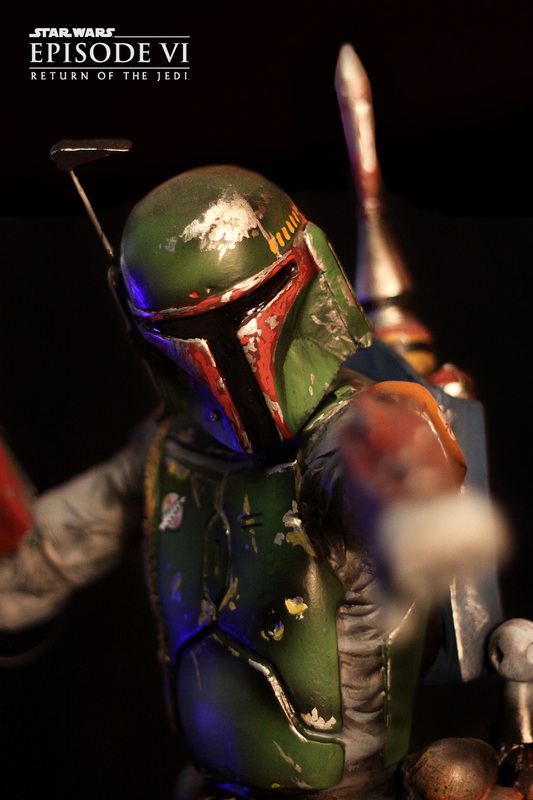 Fett might be part of the live-action Star Wars series under development. Size: 24 x 23 x 24cm. Base: Solid wood, padded feet. Once complete the base colours were laid down with spray cans and acrylics. 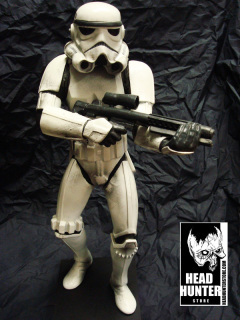 Santrooper are nearly identical to standard stormtroopers except they had additional training in specialized areas and advanced cooling systems in both their helmets and suits that offered them protection from the relentless heat. Visual differences in armor included a distinctive 'diamond' shaped left knee plate, non-ribbed chest and back plate connectors as well as reinforced abdominal plating. 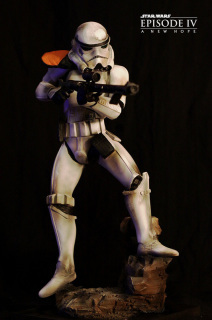 It was typical for non-commissioned officers (white and orange pauldrons) and above to remove the “drop boxes” on the waist; a redundant and unnecessary accessory given the upgraded load-bearing kit requirements for sustained operations with minimal resupply. 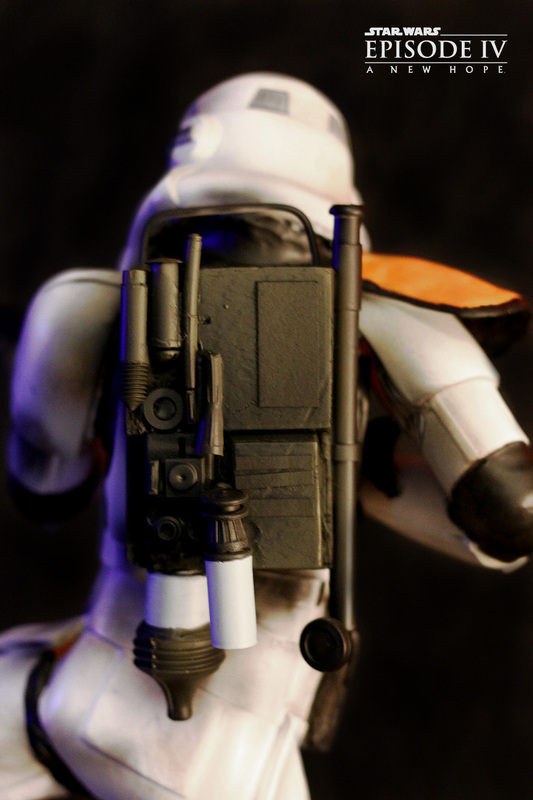 Additionally, the usual thermal detonator worn by normal Stormtroopers on the lower back was not present, as its wear and access would be impeded by the typical SD-48 survival pack. 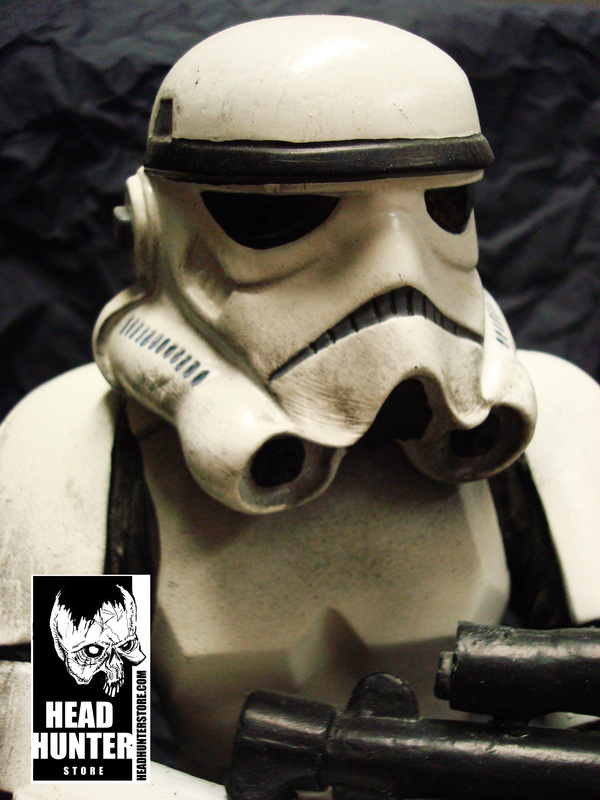 Finishing was the final stage, hours of airbrush work, and hand weathering completed the look of this STAR WARS Stormtrooper. Built for a salvaged vintage Kenner Landspeeder. -custom wooden sceneic "desert" base. 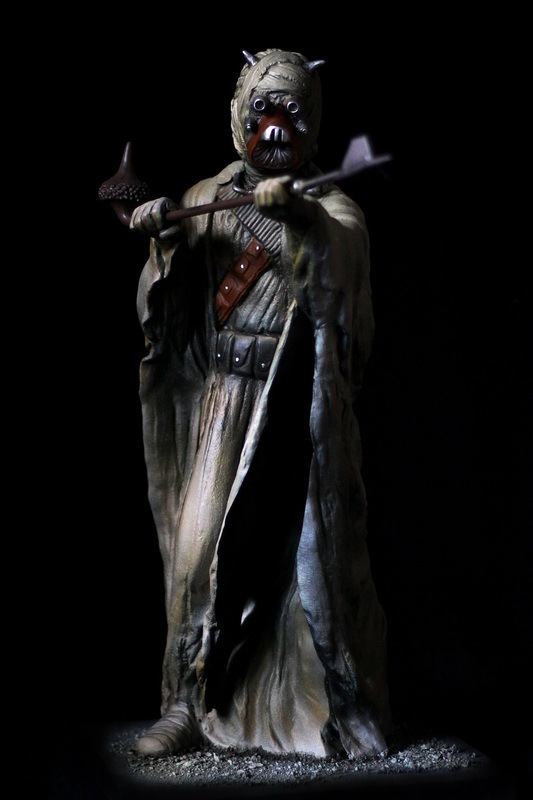 Scientific studies of the few corpses found were said to have been inconclusive, and while in part, the lack of detailed knowledge can be accounted for by the hostility of the Tatooine climate, and in part, by the hostility of the Tusken Raiders themselves, it should be borne in mind that knowledge of the Sand People—or what was thought to be known about them—was very often based on uncertain and inferential evidence. 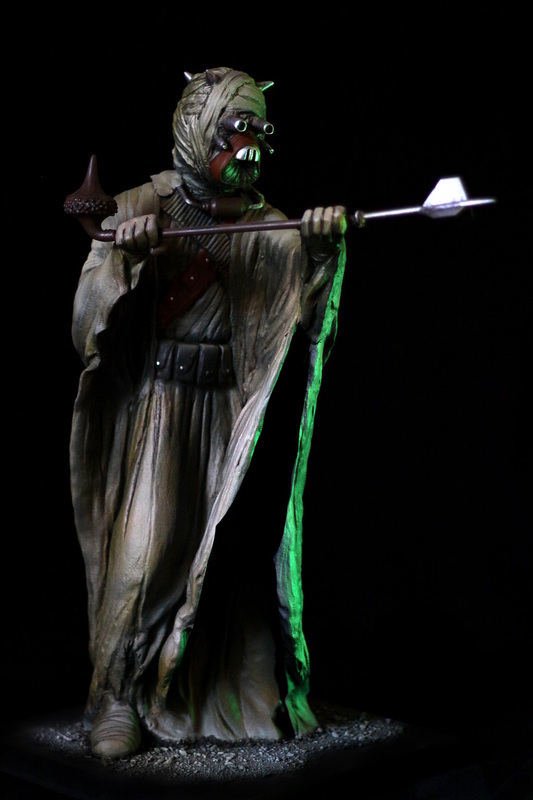 However, A'Sharad Hett's claim that he learned of the Tusken-Human incompatibility, combined with his first-hand knowledge of the Tuskens, is compelling evidence that they were a different species. 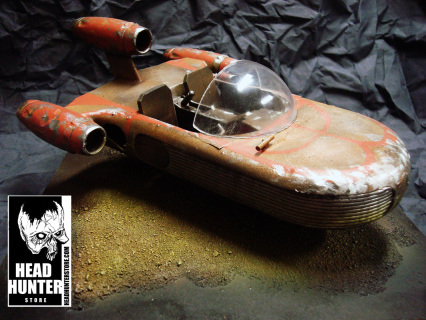 STAR WARS - SNOW SPEEDER - LARGE DISPLAY. 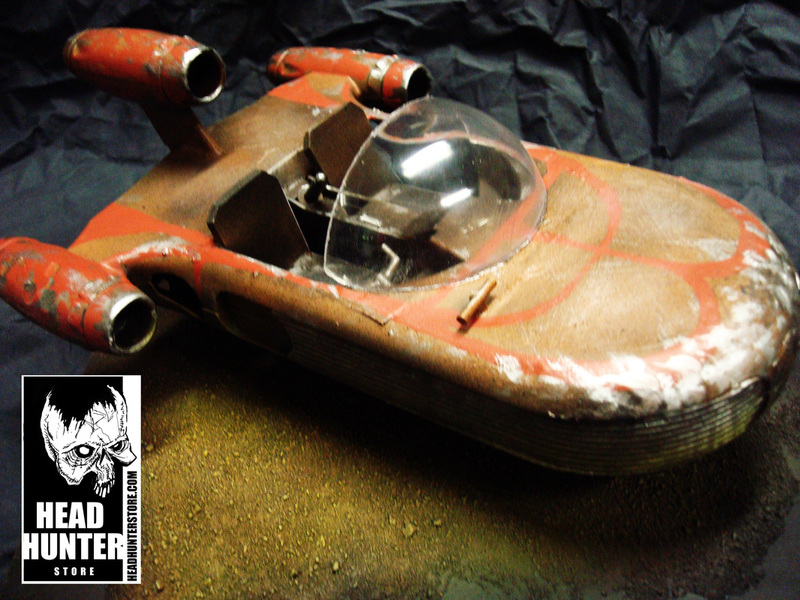 BUILD: Made from a trashed Snowspeeder toy from the 80s. It has been rebuilt, detailed. painted, weathered and finnished by hand. 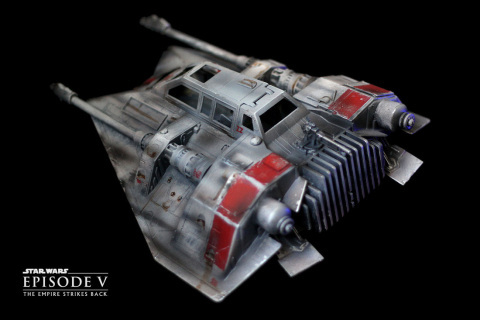 In The Empire Strikes Back, Rogue Group, led by Commander Luke Skywalker (Mark Hamill), pilots snowspeeders against Imperial AT-AT walkers during the Battle of Hoth.When their lasers prove ineffective the Rebel pilots turn to tripping the walkers with the snowspeeders' harpoons and tow cables. The snowspeeders used on Hoth are modified Incom T-47 airspeeders initially used for civilians; they are modified to survive the "hostile environment of the ice planet Hoth". 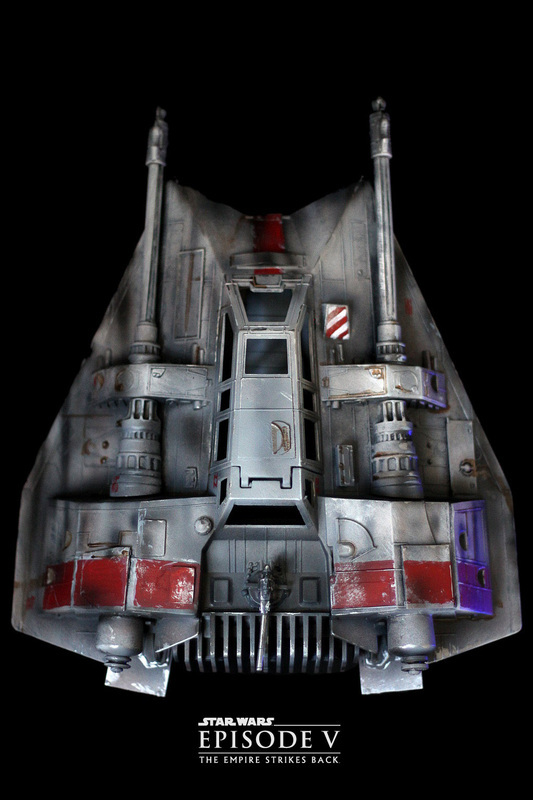 Expanded Universe material states that the Y-wing cockpit and other features were donated to the airspeeders.The two-man craft has an advanced power system and repulsorlift to compensate for additional armaments and armor, affording them a top speed of 1,000 km/h and combat speed of 600 km/h.The playable snowspeeder in Star Wars: Battlefront II is armed with concussion missiles and small tow-cable launcher. - restored and hand painted vintage toy. 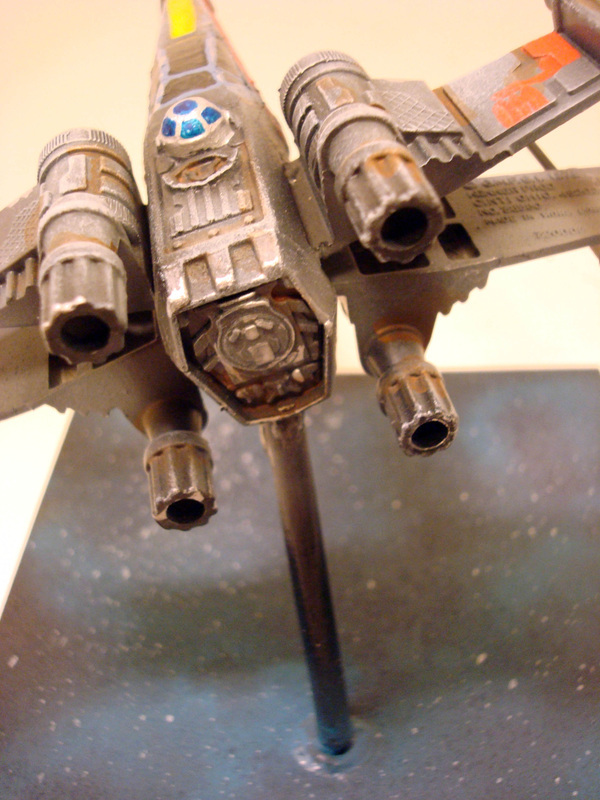 STAR WARS - XWING FIGHTER - LARGE DISPLAY. 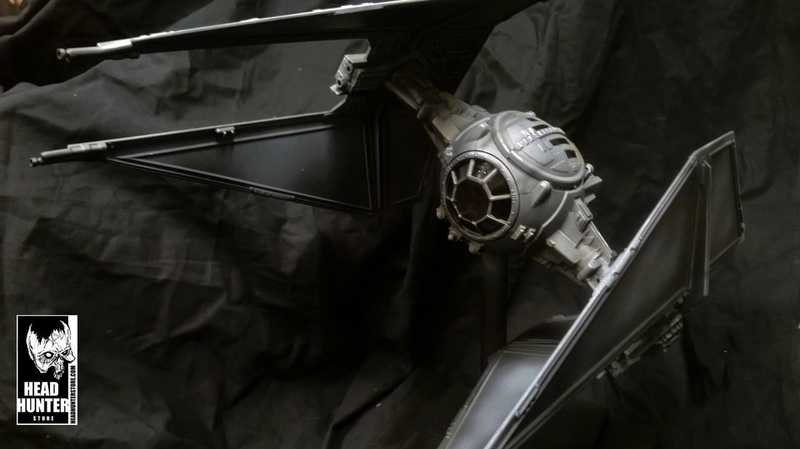 BUILD: Made from a trashed Xwing toy from the 80s. It has been rebuilt, detailed. painted, weathered and finnished by hand. 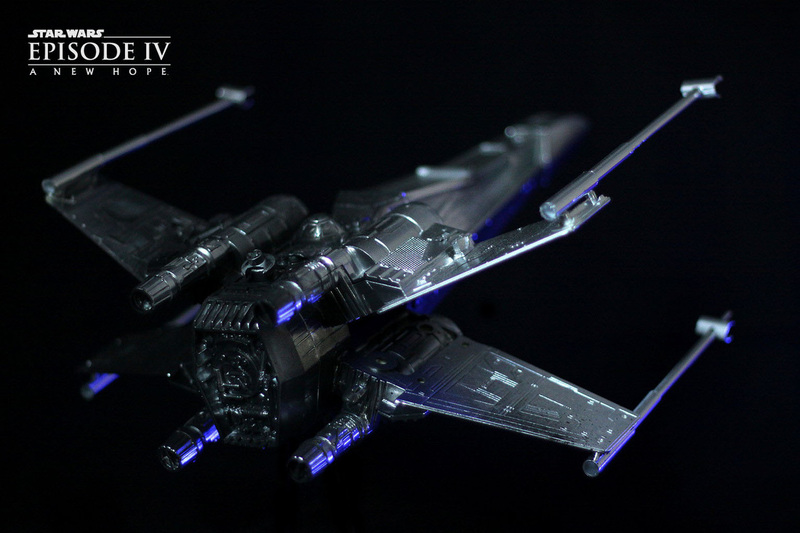 The X-wing was a prominent series of multiple starfighters produced by Incom with a characteristic "X"-shape of four wings, known as S-foils, extending out from the fuselage. 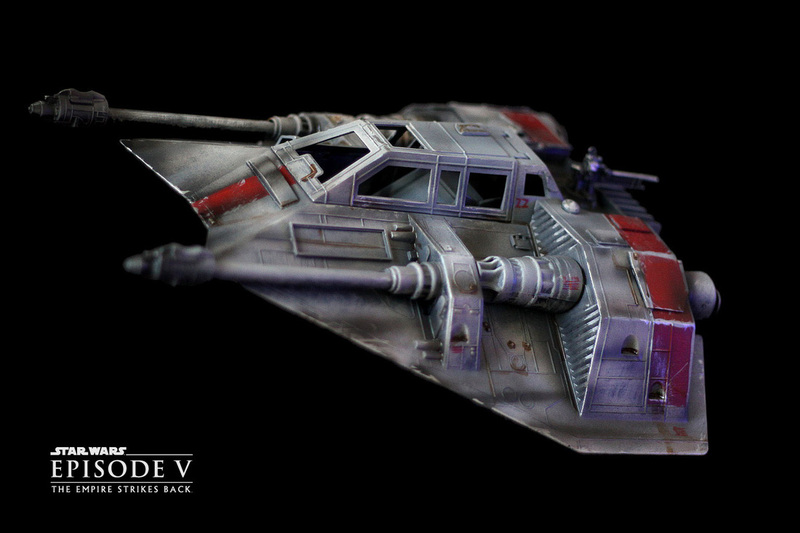 These starfighters were found in the service of the Rebel Alliance, New Republic, and also theGalactic Alliance. They were originally meant for the Galactic Empirebut when the entire Incom design team defected with the prototypes to the Rebel Alliance this deal was over. 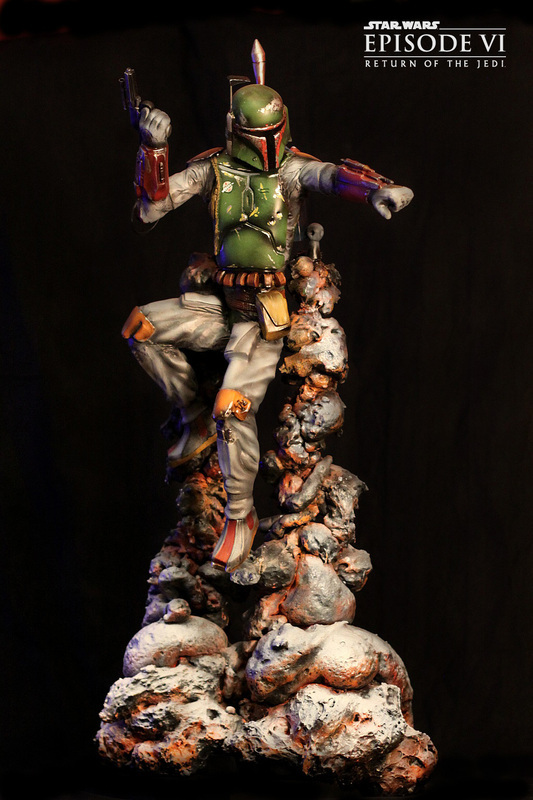 RETURN OF THE JEDI - BOBA FETT STATUE ( JUMP PACK). 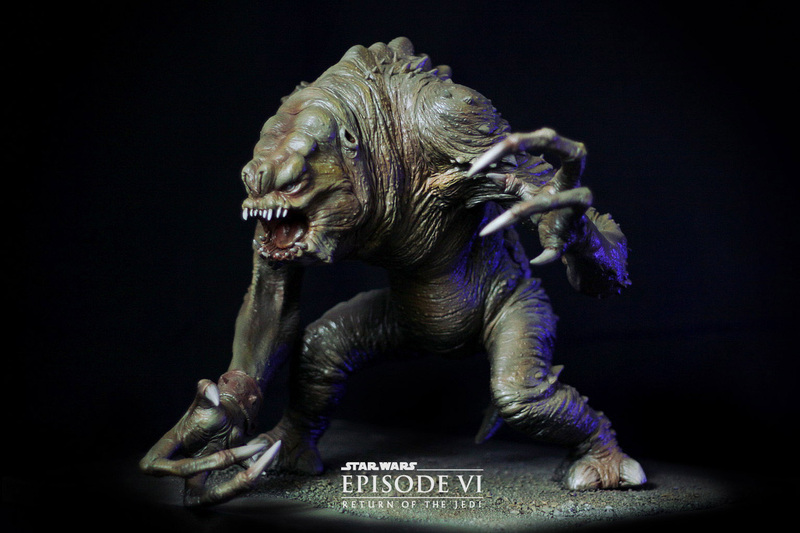 RETURN OF THE JEDI RANCOR MONSTER STATUE. Tarsunt system by Grizzidfor a Bothan merchant named Grendu, when it broke out, killing Grizzid and his crew, and causing the ship to crash on Tatooine. AJawa Sandcrawler captain named Tteel Kkak discovered the wreckage and informed Jabba's servants Bib Fortuna and Bidlo Kwerve. 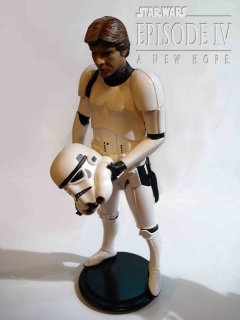 They presented it to Jabba as a birthday present. 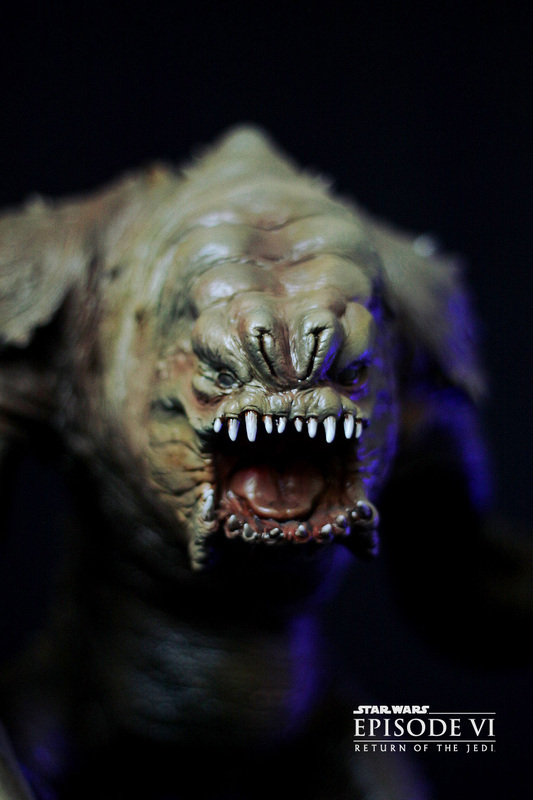 Fortuna was rewarded by being made Jabba's Majordomo, while Kwerve was fed to the rancor. SIZE: approx - 30 x 40 x 40cm. BASE: Finnished with a stunning desert finnish. Padded feet. 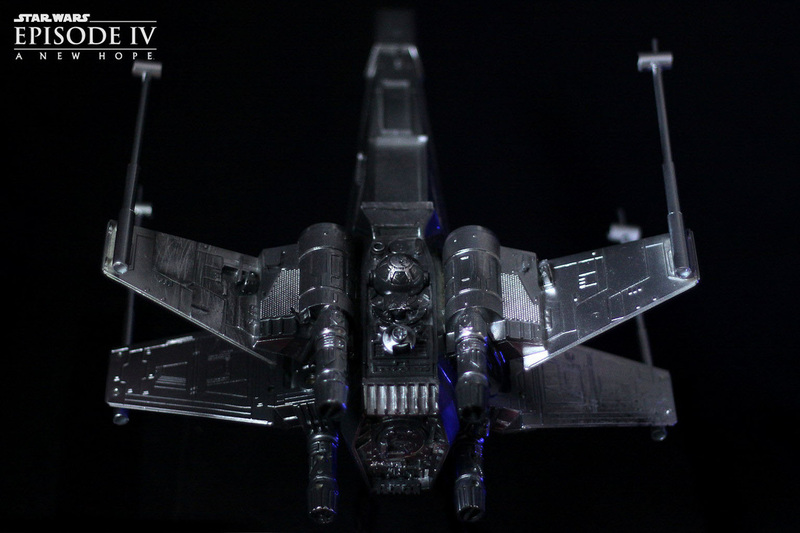 MODEL: Built from the RARE AMT kit. 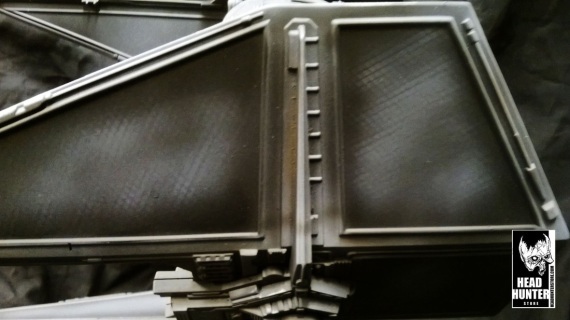 Built, undecoated, painted and finnished by hand. 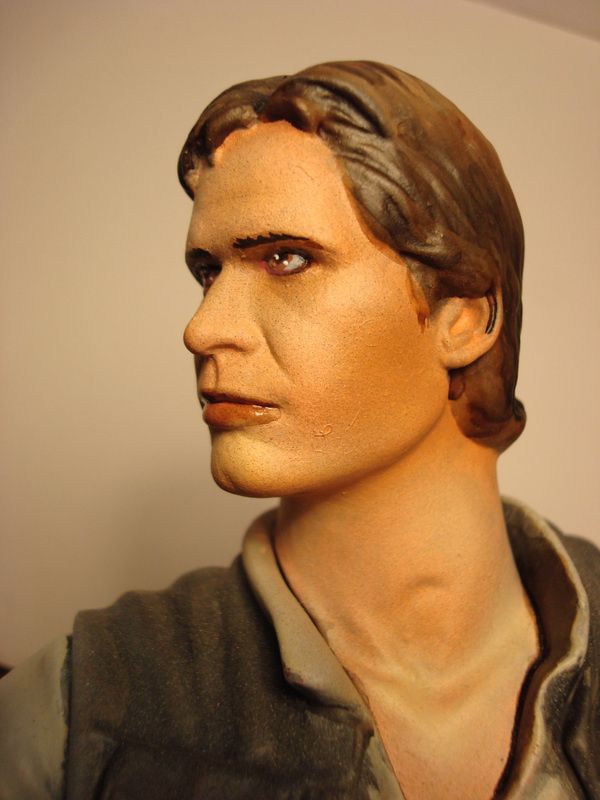 The character was created by George Lucas and numerous actors have portrayed him. 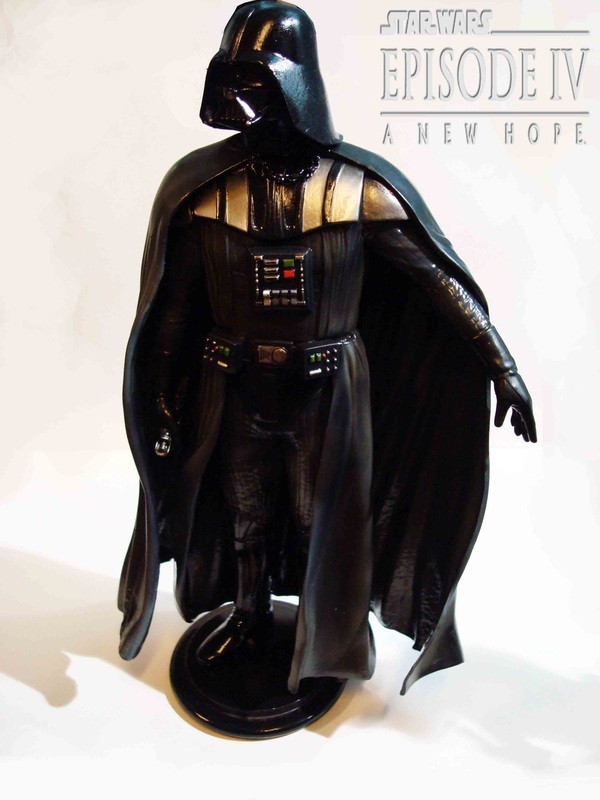 His appearances span all six Star Wars films, and he is an important character in the expanded universeof television series, video games, novels, literature and comic books. The films establish that there was originally a Jedi Knight named Anakin who fell to the dark side of the Force; he is also revealed to be the father of both Luke Skywalker and Princess Leia Organa, the two main protagonists of the original trilogy. Vader is ultimately redeemed in Star Wars Episode VI: Return of the Jedi, when he sacrifices himself to save his son, Luke. 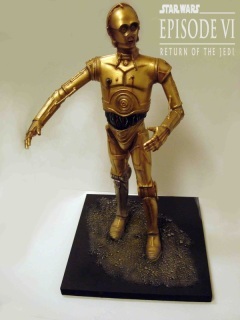 RETURN OF THE JEDI - C3-PO STATUE. In Star Wars Episode IV: A New Hope C-3PO is introduced to the audience in the opening scenes of the film, wherein C-3PO and R2-D2 are aboard the consular ship Tantive IV when it is attacked by Darth Vader’s Star Destroyer Devastator. When R2-D2 leaves the ship to deliver a secret message to Obi-Wan Kenobi, C-3PO follows R2-D2, eventually to the planet Tatooine. There, C-3PO and R2-D2 are captured by Jawas and taken to be sold. In the process of being sold to Owen Lars, C-3PO convinces Owen to buy R2-D2 as well. SIZE: approx 18x 18 x 37cm. BASE: Solid wood, with a seperb desert finnish. Base is padded. 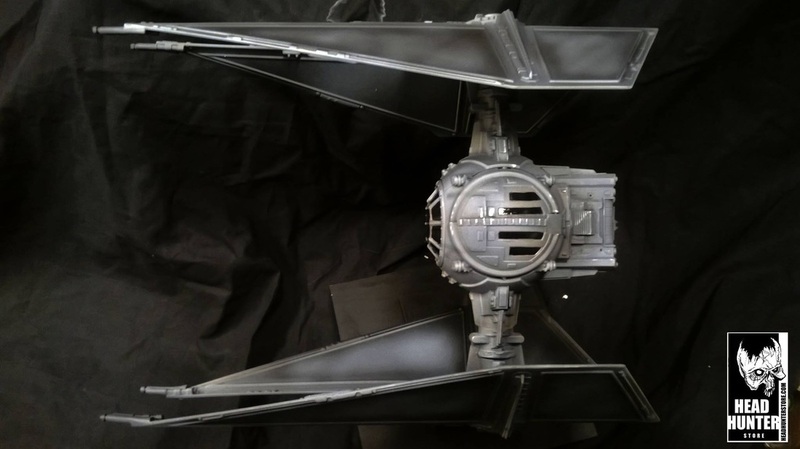 BUILD: Made from the SCREAMIN vinyl kit, built, detailed, painted and finnished by hand. Pose is custom as is the restraining bolt. 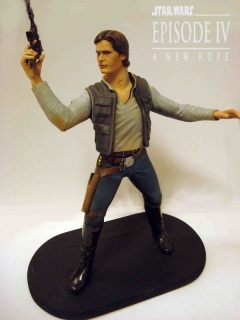 STAR WARS - Han Solo Statue. At the beginning of Star Wars Episode IV: A New Hope, Solo and Chewbacca are indebted to Jabba the Hutt; for which Solo accepts a charter to transport Obi-Wan Kenobi (Alec Guinness), Luke Skywalker (Mark Hamill), C-3PO (Anthony Daniels), andR2-D2 (Kenny Baker) to Alderaan in Han's ship, the Millennium Falcon. When they arrive, Alderaan has been destroyed by the Death Star, and the Falcon is captured. Enticed by the likelihood of reward, Solo and Chewbacca help Skywalker rescuePrincess Leia (Carrie Fisher), held captive aboard the station. After delivering Skywalker, Leia, and the droids to the Rebels, Solo and Chewbacca receive payment for their services and depart; but return to assist Skywalker, ultimately enabling the latter to destroy the Death Star. Following this, Han is appointed a Captain by the Rebel Alliance. SIZE: approx 18x 18 x (height)37cm. BASE: Solid wood, Base is padded. 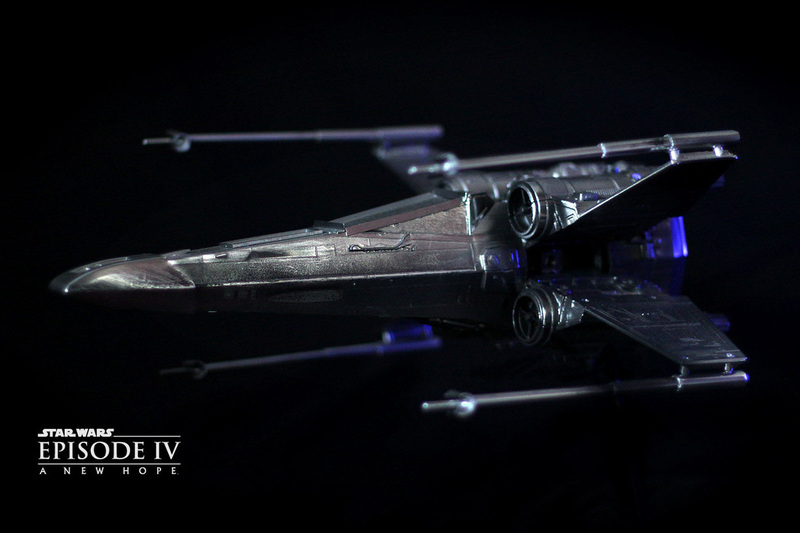 BUILD: Made from the AMT vinyl kit, built, detailed, painted and finnished by hand. 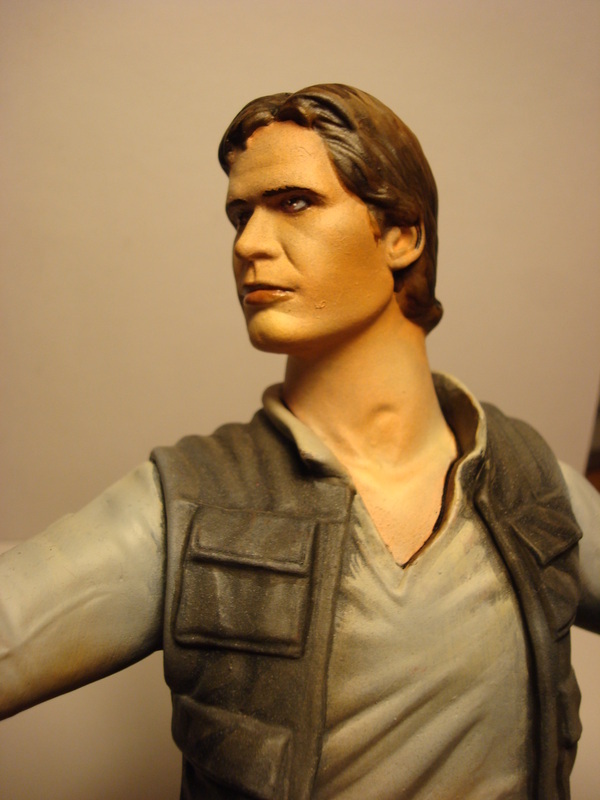 From August 1995 through December 1996, Han Solo in Stormtrooper Disguise was available exclusively as part of a Kellogg's FROOT LOOPS cereal offer. 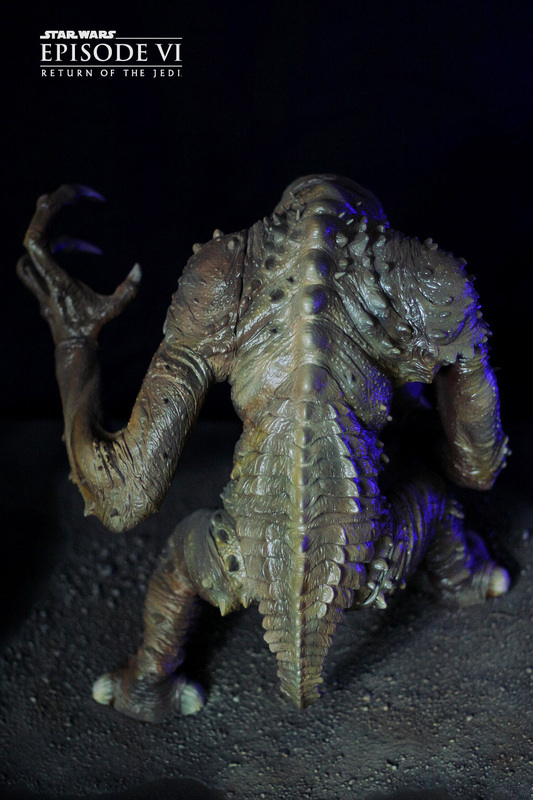 By sending in the official order form and 2 proofs of purchase, you would receive the figure for free in the mail. 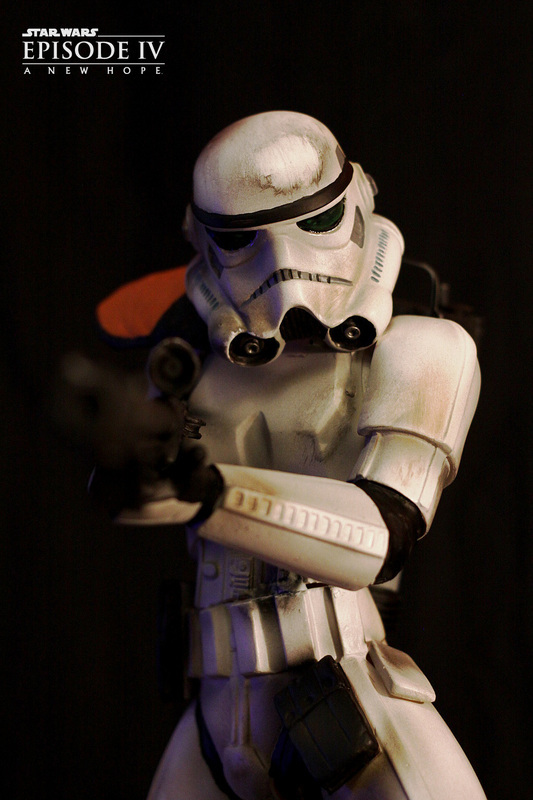 The figure arrived in a plastic baggie inside a white mailer box, and came with a removable helmet, but no weapon. 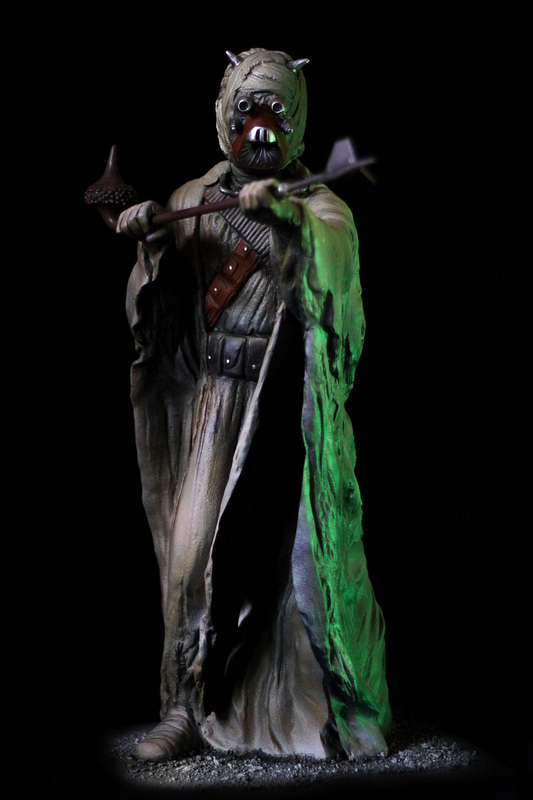 This is a 11" statue depicting that very figure, in statue form. In Star Wars Episode II: Attack of the Clones, the first troopers were cloned from bounty hunter Jango Fett, to be the Army of the Republic in the Clone Wars. In Star Wars Episode III: Revenge of the Sith, the Clone troopers execute Order 66 at the command of Chancellor Palpatine, attacking their Jedi generals. 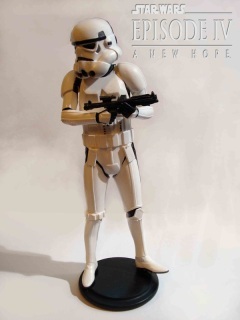 When the Empire is firmly stabilized and an Imperial Army/Imperial Navy established, the stormtroopers become Palpatine’s personal army and are stationed on Imperial bases and cruisers, as well as on the Death Star. They maintain these roles until the Empire’s collapse after Palpatine's death in Star Wars Episode VI: Return of the Jedi. 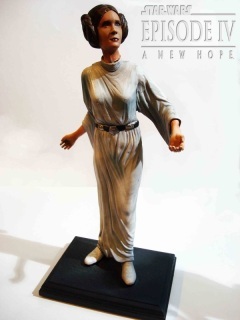 In Star Wars Episode IV: A New Hope, Leia is introduced as the Princess of Alderaan and a member of the Imperial Senate. Darth Vader captures her onboard the ship Tantive IV, where she is acting as a spy for the Rebel Alliance. He accuses her of being a traitor and demands to know the location of the secret technical plans of the Death Star, the Galactic Empire's newest and most powerful weapon. Unknown to Vader, the young senator has hidden the plans inside the Astromech droid R2-D2 and has sent it to find Jedi Master Obi-Wan Kenobi on the nearby planet of Tatooine. 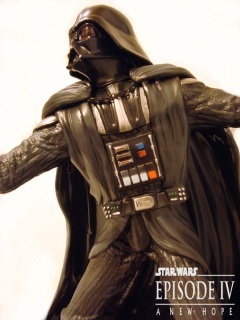 Later, Vader has her tortured, but she resists telling him anything. Still believing she could be useful, the Death Star's commander, Grand Moff Tarkin, threatens to destroy Alderaan with the super weapon unless she reveals the location of the hidden Rebel base. She lies to them, and Tarkin orders Alderaan to be destroyed anyway. She is finally rescued by Luke Skywalker, Obi-Wan Kenobi, Han Solo, the Wookiee Chewbacca, and the two droids, R2-D2 and C-3PO. When they finally escape, at the expense of Obi-Wan's life (sacrificed in a duel with Vader), they take part in the Battle of Yavin, in which Luke destroys the Death Star in his X-wing fighter. In the Massassi Temple at the hidden Rebel base on Yavin 4, the radiant Princess Leia Organa presents the Alderaanian Medal of Freedom to her rescuers and the heroes of the battle. 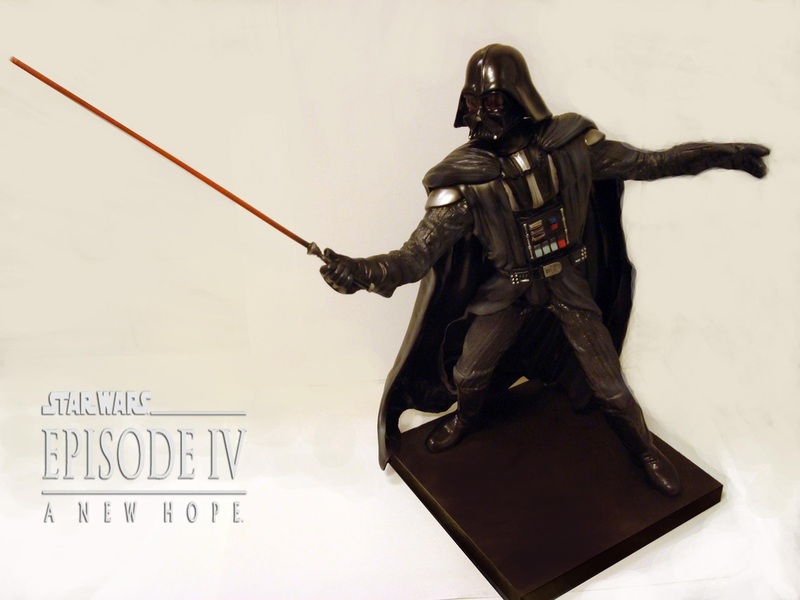 STAR WARS - DARTH VADER STATUE 11"
The character was created by George Lucas and numerous actors have portrayed him. His appearances span all six Star Wars films, and he is an important character in the expanded universe of television series, video games, novels, literature and comic books. The films establish that there was originally a Jedi Knight named Anakin who fell to the dark side of the Force; he is also revealed to be the father of both Luke Skywalker and Princess Leia Organa, the two main protagonists of the original trilogy. 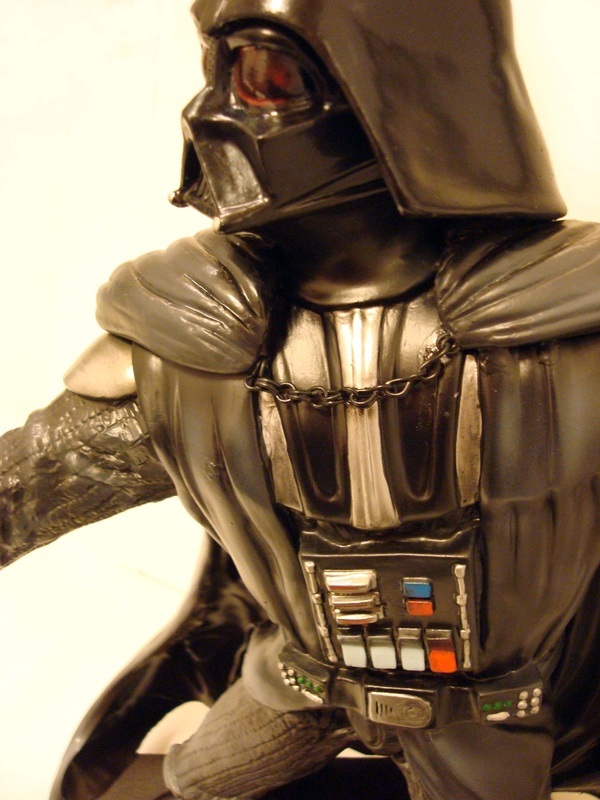 Vader is ultimately redeemed in Star Wars Episode VI: Return of the Jedi, when he sacrifices himself to save his son, Luke. 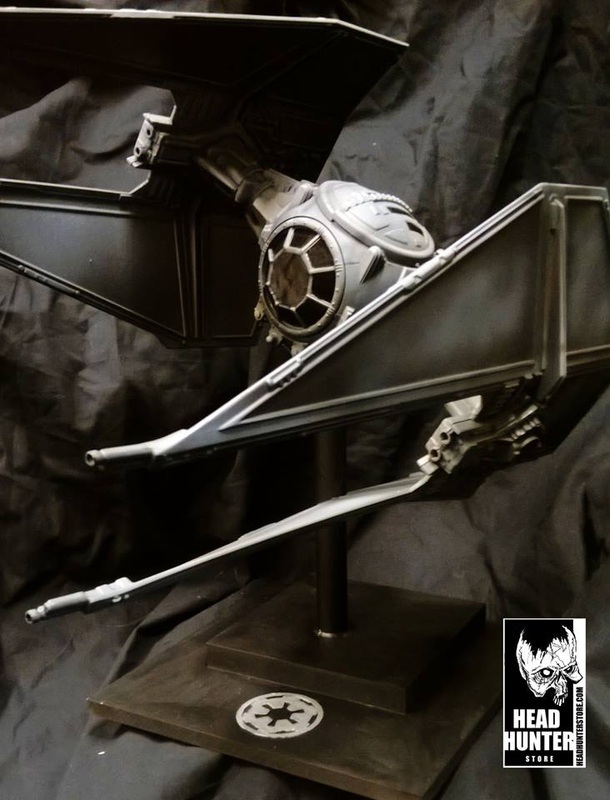 STAR WARS - TIE FIGHTER DISPLAY. 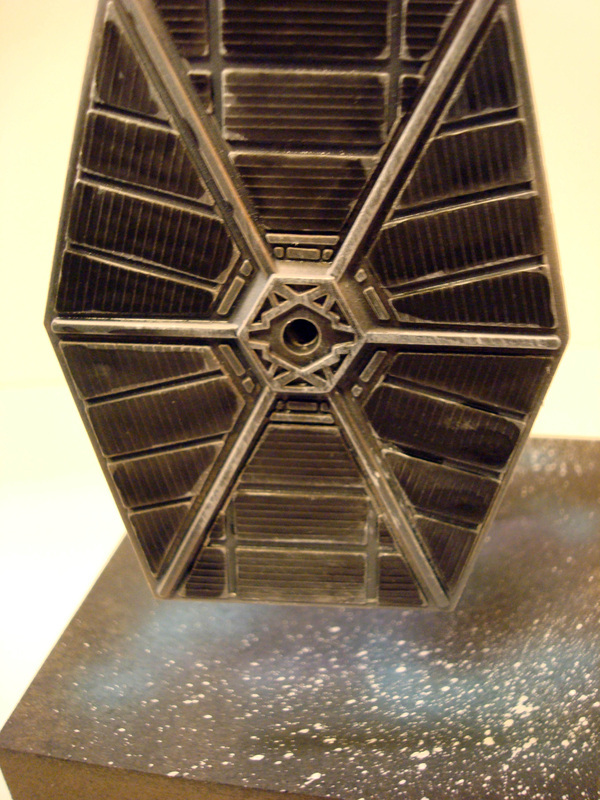 Star Wars literature states that Sienar Fleet Systems manufactures TIE fighters and most TIE variants. TIE fighters' solar panels power a twin ion engine (TIE) system that accelerates gases at a high speed along almost any vector, affording the ships tremendous speed and maneuverability.Described as lacking a hyperdrive, life support, or shield generators, the fragile TIE fighters are deployed in large numbers from bases or larger ships; a Star Destroyer carries a wing of 72 various TIE craft. 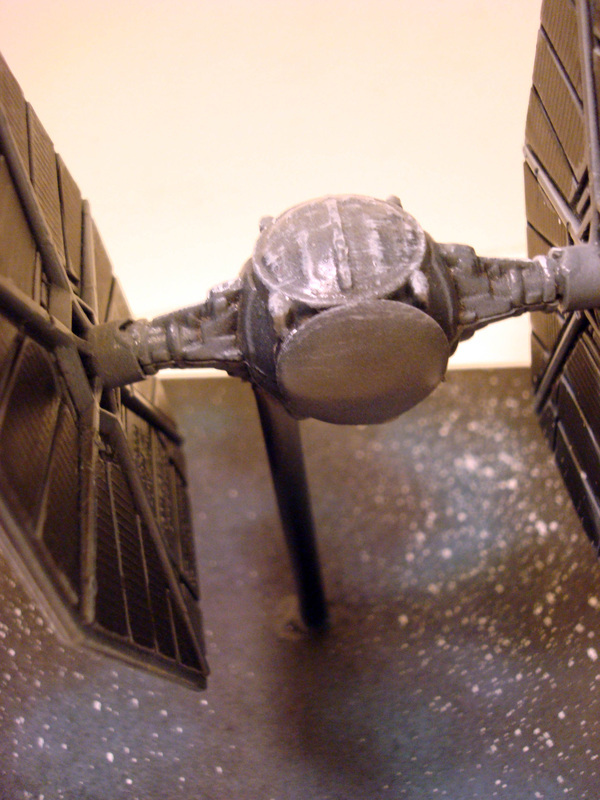 Although Expanded Universe material often describes the TIE fighter as lacking anejection seat, the player can eject from TIE craft in LucasArts' TIE Fighter flight simulator. Expanded Universe material holds that TIE fighter pilots, who undergo intense physical and psychological testing, are trained to be intensely loyal to Emperor Palpatine and the Empire, willing to sacrifice themselves and their wingmates to accomplish their mission.SIZE: 14 x 12 x 12 cm approx. 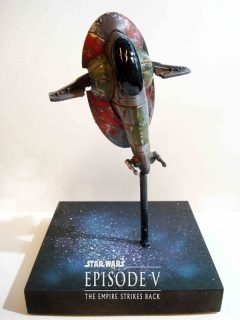 MODEL: Made from a used VINTAGE STAR WARS die-cast toy. That has been detailed, undercoated and painted to a high standard. BASE: Solid wood base, with star field design. Felt feet. 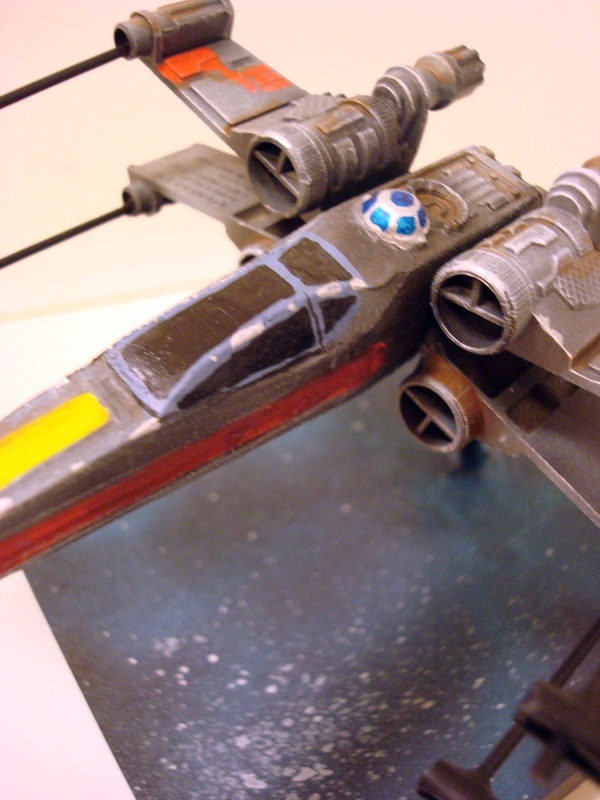 STAR WARS - X-WING FIGHTER DISPLAY. 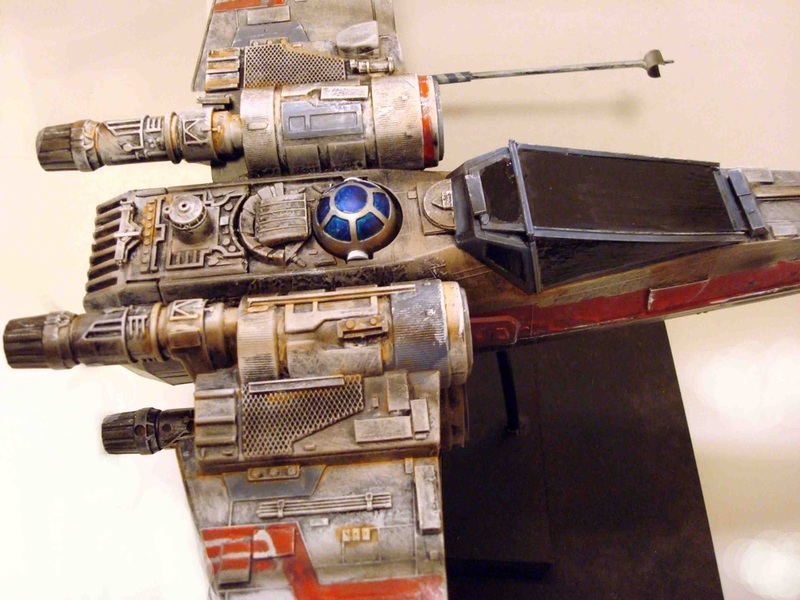 According to roleplaying and other material, X-wings depicted in the movies and Expanded Universe material that takes place around the same era are equipped with four laser cannons and a pair of proton torpedo launchers. 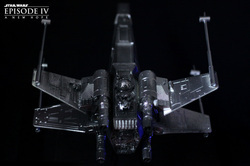 The fighter has two flight modes: one in which the wings are flat and another when they are expanded into "attack position", affording the wingtip lasers a larger fire area. 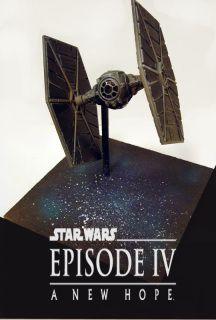 "S-foil" servomotors control the transition between the two, hence the expression "to lock s-foils in attack position".Lacking an on-board navigation computer, they rely on an astromech droid to calculate hyperspace jumps. The presence of a hyperdrive and deflector shields differentiate the X-wing from the Empire's TIE fighters, emphasizing the importance the Rebels place on pilots surviving their missions. 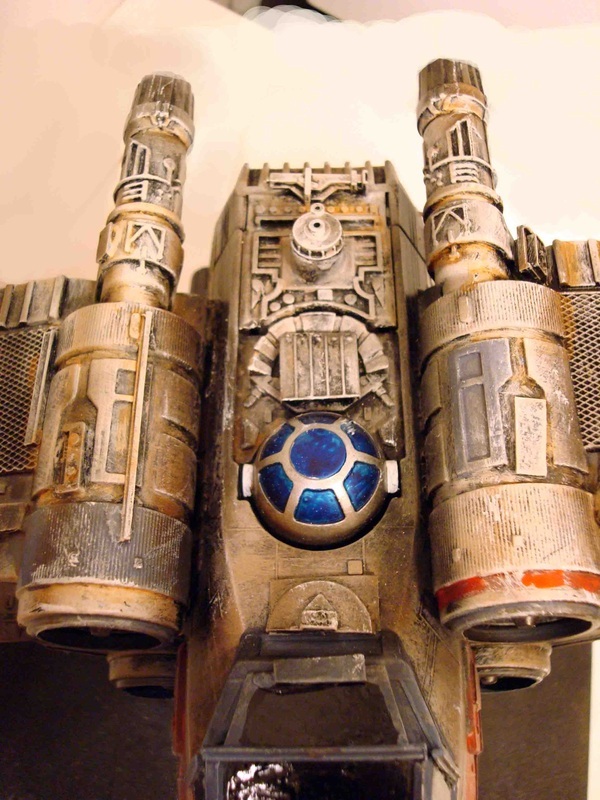 Novels and roleplaying material state that the X-wing continues to be refined and upgraded in the years beyond Star Wars Episode VI: Return of the Jedi; the "XJ"-series X-wings depicted in the war against the Yuuzhan Vong have a third proton torpedo launcher, stronger lasers, and improved engines. 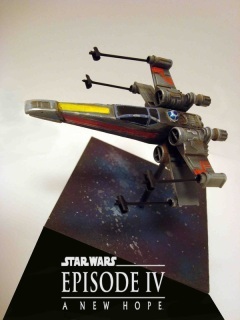 BASE: Wood with painted star field effect. Padded base. CONSTRUCTION: This item is made from a VINTAGE STAR WARS x-wing Die cast model. It was destroyed, so has been restored, detailed and painted by hand. 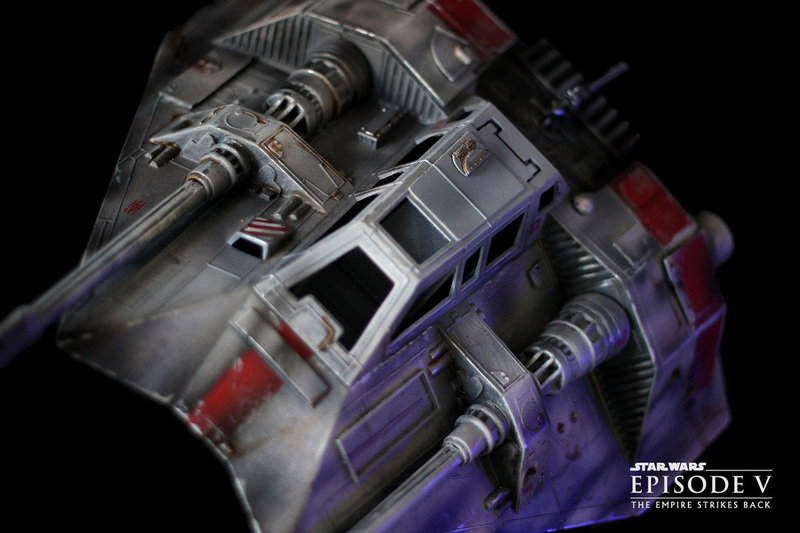 The ship's design is said to resemble the shape of a street lamp.However, the actual inspiration for the shape of the ship was a radar dish according to Nilo Rodis-Jamero, the assistant art director and visual effects creator on The Empire Strikes Back. 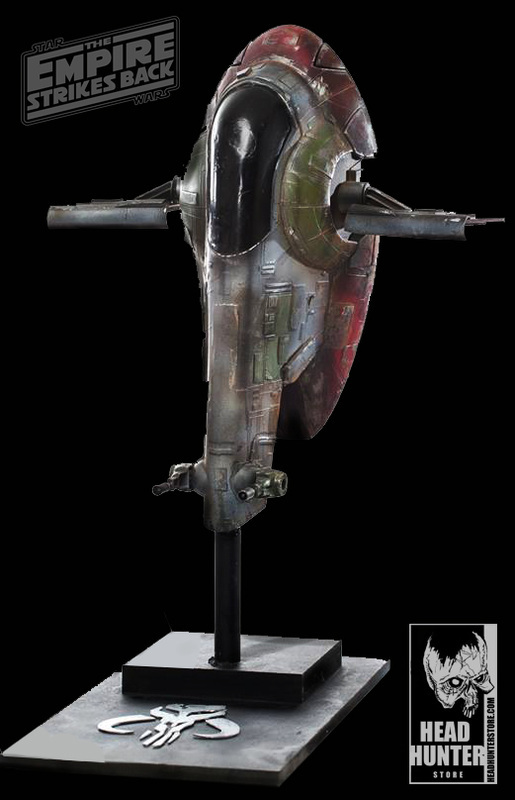 Rodis-Jamero created the initial design after seeing Joe Johnston's ideas for Boba Fett and states that "the original design I had was round, but when you looked at it from the side, it became elliptical...George [Lucas] thought it was elliptical, so that's what it became." 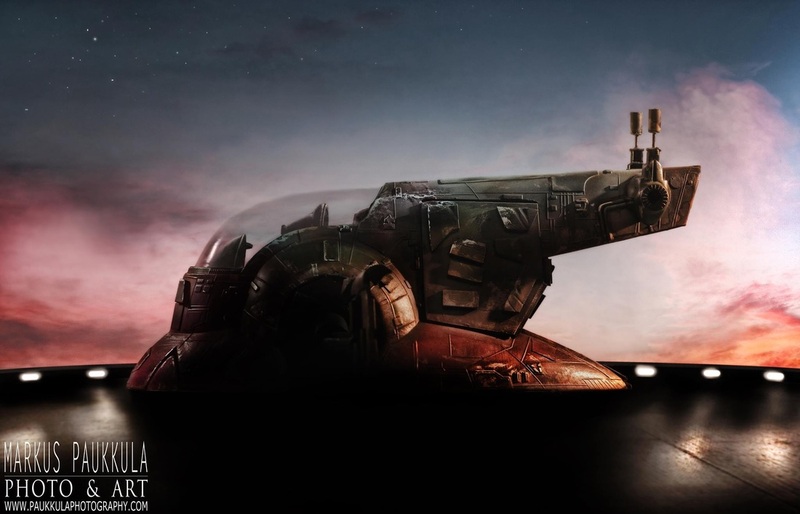 He goes on to say that "[w]hen building the ship at ILM, someone looked at the street lamps and pointed out that they looked like Boba's ship. So everyone began to think that was where I got the idea for the design." 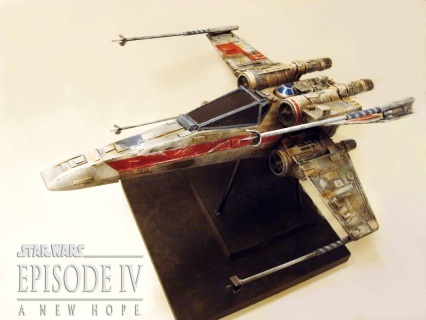 Its appearance in the original release of The Empire Strikes Back was realized by a combination of matte paintings and a 69-centimeter model.